Android Leads The World Samsung Samsung Galaxy S7 will Launch on 11th of March 2016. Samsung Galaxy S7 will Launch on 11th of March 2016. Samsung has a history of simultaneous launches, but the company doesn’t always hit all regions on the same day. 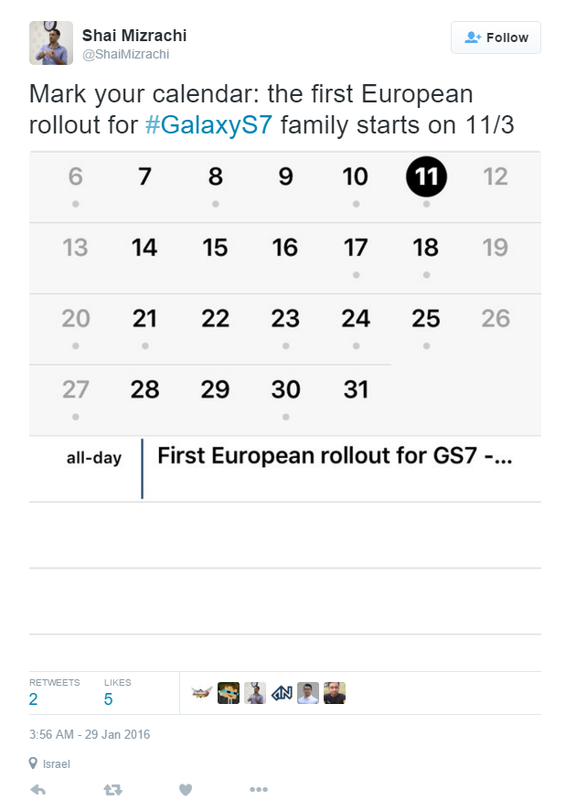 The Galaxy S6 from yesteryear didn’t launch in Europe until a few weeks after it landed in the US. We’ve heard that March 11th date for other regions, and here it is again: Europe is also expected to get the Samsung Galaxy S7 that day. This follows accidental word from a Chinese carrier about plans to offer the device that month, and @evleaks — who has been spot on for Galaxy S7 information — has suggested the same for the US. A simultaneous launch also signifies that Samsung has all their ducks in a row in terms of supply. Their findings from the 2015 smartphone launches should help them properly gauge demand for this year’s ordeal, so it allows them to be more pre-emptive about shipment estimates in each market instead of waiting for pre-sale numbers and carrier orders. Samsung has to hit a homerun with the Samsung Galaxy S7 after stumbling about with prior smartphones in the lineup, so it’s no surprise they want to hit the ground running fast.